Today I snapped a picture of my kids enjoying a few minutes outdoors as we were cleaning up leaves. The image was perfect, the faces were all smiles and it is so nice to see this happiness, that is often fleeting in tweens and teens. After I snapped the picture I stopped, stared and looked down at my smartphone and I saw the message no one wants to see: “You have no storage available.” I wanted to scream. I refuse to delete photos. Seriously, I take photos with the best intentions of using them, sharing them, transferring them to online storage, but sometimes I don’t follow through. No way am I going to delete a photo of my kids, or the smiles on their faces, food that we ate the other day, what if I never get that shot again? Why am I snapping all these photos and what has technology done to embellish my photo-snapping habit? 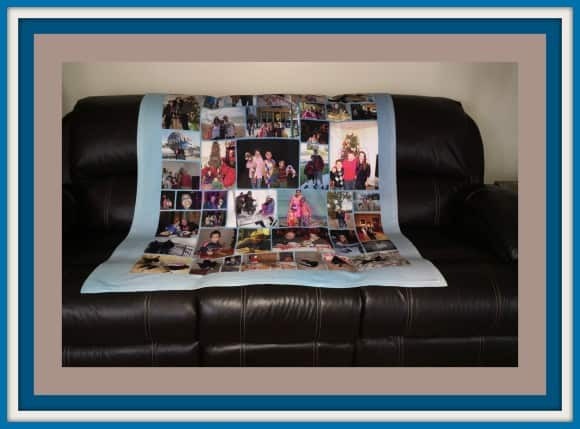 I want to be warmed up with the memories each time I look at a photo and what better way to capture warmth and celebrate photos than in a Fleece Photo Blanket? Here’s my story of lavishly living life out loud and my 7 Tips for making a fleece photo blanket. Just looking at a photo of my family envelopes me in warmth, and when a day has gone wrong, or a smile has failed to make an appearance, I need that photo to remind me, that there are lots of good days, to smooth over those not-so-good days. We are all guilty of photo-snapping pleasure, over-indulging, snapping way more than we used to, because we can edit, and choose what we want to use and develop. When your phone’s storage gets to its tipping point, and if you decided not to store anything in Cloud or other online storage, you have to move those photos off your phone to make room for m more. Today’s smartphone technology has created the need for other ways to display these images. With this in mind I sought out where to make a fleece photo blanket and I can assure you I have gotten mine from the best of the best. Today, I went to a site I found online. I was pretty overwhelmed initially because there were so many choices of what I could do with my photos, but when I really got down to the basics, I knew that there were two good choices, 2 blankets that my family could enjoy, and I could enjoy because I was able to use up my photos on my phone and clear the way for more! I chose 2 totally different blanket-types to celebrate 2 totally different kinds of photos: Plush Fleece and Standard Fleece and each is 50″ x 60″ perfect for throwing on when sitting on the couch, bed, or in a chair working! Pretty much a standard Plush-lovin’ girl, I love soft, snugly and cuddly, but choosing this option meant that I would be given up a touch of clarity. That’s fine though because my intent with blanket number one was quite selfish… My own branded blanket, with my logo, that would wrap me up as I write to all of you each day, so plush was on the order of the day. You can see the sheen, so you know how plush this is, but look at the clear resolution even on the Plush Fleece, the quality is unbelievable. The back is standard white(I chose it this way) but I had fun with my background on this particular Plush Fleece Photo Blanket as I used an animal print background to support my logo! 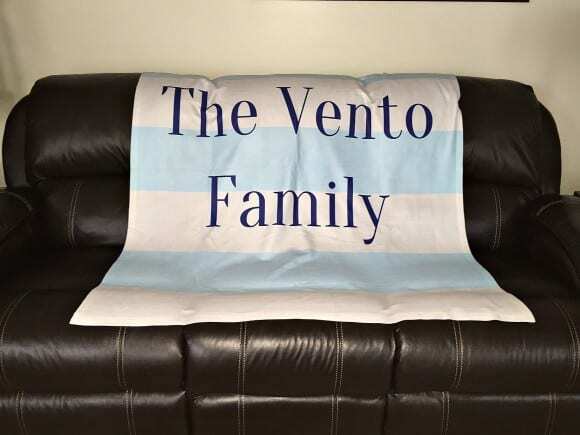 For my family blanket I decided on the Standard Fleece which offers images that are much clearer and more crisp resulting in a fun-loving blanket that everyone can fight over! I knew what I wanted for the Plush Fleece right away and I just went ahead and created it. 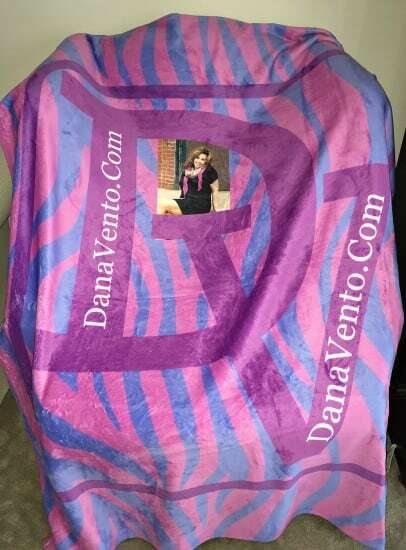 This is just the back of the blanket and I wanted you to see the size of this and how crisp the print is. First things first, look at your smartphone and decide what the Theme of the blanket is going to be, that was the hardest part of my preparation. There were so many photos and I had to decide what I wanted my blankets to be. My decision to create what I called, “A Life In Passing” was a way to capture my children, cat and my husband and self in a format that offered enough photos that we could see life progressing, while celebrating family. Trust me on this tip, please! My kids, as will any others out there, counted the number of times they each appeared as the ‘star’ of the blanket and I made darn sure that I planned it out ahead to keep things all even. Goodness the cat even had her own starring photos. You know how you kind of get locked into the mode,”Oh this looks great!” Don’t! Let that shuffle button, re-size, move things around and change things up, you can always reorder the items on the page as you want them, but that shuffle button is your friend. You have 2 sides of a blanket, use them both, we sure did. I put our last name on the back, chose a background fleece color, a font and what I wanted on it. You can even add images, I just kept ours simple. For every photo I put in there, I made sure I edited, cropped, and got the image in that I wanted, and it took seconds. It took me longer to decided on a photo than it did to edit. This is the toughest decision you will make, because if you want PLUSH you sacrifice the images a bit, but if you want Standard, you sacrifice the total plush comfort, however either blanket is a home-run. Here I used A Logo for the Plush Fleece because letters had enough depth to them and I knew the Logo would work perfectly. The Standard Fleece is a bit thinner but just as comfortable and the images are clear as clear can be based on the images provided! So, for everything I try, I can tell you I am not always great at it, but there is a Customer Service Department. Ask whatever site you end up on for customer service help to navigate, save and keep the product as YOU want it. It’s time to make the perfect holiday gift. Do you have tons of photos of Grandma and Grandpa? Do you have lots of pictures of your ‘significant other’? Too many photos of the kids, vacations, dinners? What rocks your world will rock the blanket, just get creative and upload. Have fun with it, because creating is the spice of life. Great gifts from cutting boards to blankets and everything in between are all just a few finger clicks away! 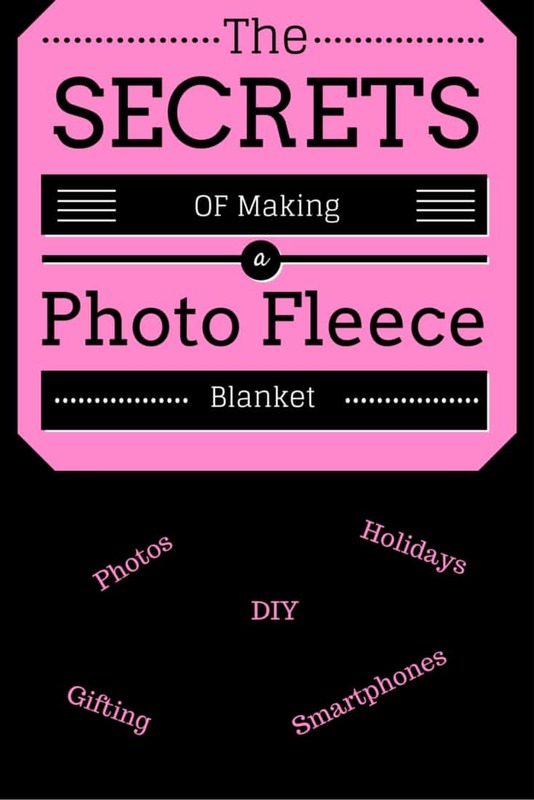 These are my 7 Tip For Making A Fleece Photo Blankets. This is just like scrap-booking, but you are doing it on line and the results are instantaneous. I am a DIY Person, but you don’t have to be, because you can literally just pop your photos in and create without doing much else. I spent more time creating because I am very obsessive compulsive, but I can tell you no matter how you do it, the results will be stunning. Are you ready to lavishly live life out loud and snap more photos on your smartphone. Clear the images, take more and repeat. Sharon recently posted..2018 Pluto Trigger – A Bluetooth Camera Remote using your smartphone! Hi. How long does it take for shipping? Thank you. Thank you for replying. Have a great week! I am not a huge fan of photo blankets. I rather have actual photos. It would make a cool graduation gift though. This looks like a great idea & a pretty much a wonderful gift option too on the other hand. The tips are quiet handy that I would love to try one such blanket & gift to my parents. That is pretty cool! I have ordered a fleece blanket with several family photos on it. I had no clue I could do it myself!! Thanks for sharing! I love this smart idea, this is great gift ideas too. That looks so cool I will try to make one of these sometime, Mine will not look as good as your but that is ok.
How adorable is that concept. Such an awesome way to make memories last! I refuse to delete photos too, so I pick my favorite ones so I can keep them on my phone and the rest goes to the computer!